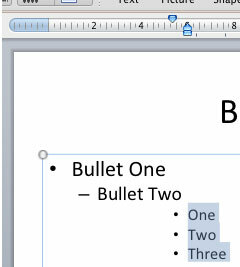 Learn how to adjust the position of bulleted paragraphs vis-à-vis the bullet using the Left Indent Marker in PowerPoint 2011 for Mac. 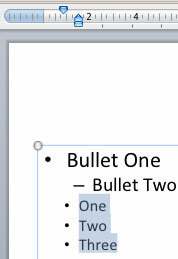 While it is a great option to change the placement of your bullet character and the paragraph following the bullet, it's not always the best option to make both these changes individually -- especially if you want to retain the spacing between the bullet and the succeeding paragraph. It's in times like this that you will appreciate the availability of the Left Indent Marker, shown highlighted in red within Figure 1, below. 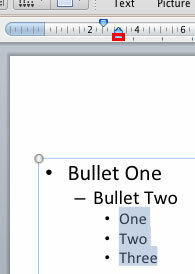 You can use both the First Line Indent Marker and Hanging Indent Marker to tweak bulleted paragraphs in PowerPoint 2011. To use both the First Line Indent Marker and the Hanging Indent Marker together, you can use the Left Indent Marker, shown highlighted in red within Figure 1, above -- this acts like a lock on the First Line Indent Marker and the Hanging Indent Marker. To view any of these indent markers, your Ruler must be visible. Select the bulleted paragraph(s) for which you want to tweak the position. In Figure 1 above, you can see that all of the 3rd level bulleted paragraphs have been selected. 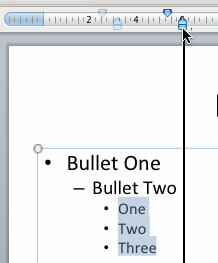 We have selected 3rd level bullets in this example because they provide enough space towards both the left and right sides of the selected paragraphs -- if we had selected a first level paragraph, we could have only moved it rightwards. 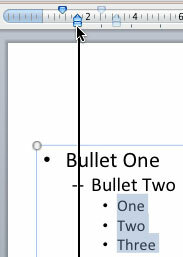 If you want to increase the indent of the bullets, click on the Left Indent Marker and drag it rightwards along the Horizontal Ruler as shown in Figure 2. It is quite possible that by mistake you select the Hanging Indent Marker that sits right above the Left Indent Marker -- make sure that you click and drag the latter. As you can see in Figure 2, the First Line Indent Marker also moves as you move the Left Indent Marker. Note: Pressing the Command key while you drag the Indent Markers will give you more control over the placement. Stop dragging in the new position where you want to place the selected paragraphs. In Figure 3 you can see that the selected bullet paragraphs moved rightwards. Compare Figures 2 and 3 to see the increased indented space. You can also drag the Left Indent Marker towards the left, as shown in Figure 4. In Figure 5 you can see that the selected bulleted paragraphs have been moved leftwards beyond their initial position (compare Figures 1 and 5). Note that wherever you move the Left Indent Marker, the space between the First Line Indent marker and the Hanging Indent Marker will remain unchanged.